Concrete (along with asphalt) has traditionally been one of the most common paving materials used. It's low cost per square foot makes it the natural choice of many homeowners as it initially seems to be a relatively inexpensive option. In reality, the inevitable cracking of concrete leads to a long-term cost that's far greater than installing brick pavers, without providing any of the benefits pavers offer. It is almost inevitable that concrete will crack at some point in time. Common causes of cracking are when the base moves due to settlement, roots or heavy equipment. Concrete can also crack as a result of the expansion and contraction caused by changes in the weather. The reason contractors place joints in concrete pavements and floors is to encourage the concrete to crack in a neat, straight line at the joint. But this doesn't always happen, and cracks can appear at random anywhere across the surface of the concrete. As these cracks form one by one, year after year, it is often difficult to exactly match the color and composition of the original material each time a repair is needed. As such, a concrete surface gets uglier and uglier with each repair. The alternative to repairing the concrete is to replace the entire structure when the cracks become unbearable. By the time it's dismantled and properly disposed of, it will likely cost eight to eleven dollars per square foot each time you have to replace existing concrete! Stamped Concrete with Cracks: "Stamping" concrete is a common way of trying to achieve the attractive patterns associated with actual paving stone material. The stamping is done after the concrete has been poured and before it begins to harden. 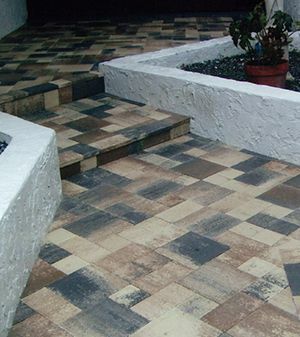 Stamped concrete is usually tinted (colored) before it is poured. There are standard colors that can be added to the concrete as it goes into the truck. Unfortunately, the problems associated with maintaining concrete are compounded with the addition of pattern and color. Patching cracks with regular gray concrete means creating unsightly scars, while trying to replace a cracked portion of concrete with a new piece that exactly matches in pattern and in color is nearly impossible. 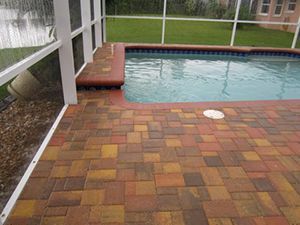 Interlocking pavers solve all of the problems described above, and are appropriate for any paving application including patios, pool decks, driveways and walkways. Because pavers are individual units or "bricks," the natural joints between each paver will "give" with pressure, expansion and contraction, eliminating the cracking inherent to conventional asphalt and concrete pavement. Installed over a base of sand, pavers actually increase their structural capacity over time. With a minimum rating of 8000 psi, paving stones are one of the strongest materials available. One of the biggest advantages of pavers is that if a repair ever does become necessary, pavers are manufactured to be uniform and can therefore easily be replaced without leaving ugly patches or scars. Brick Pavers come in a wide variety of surface finishes, colors and shapes that will complement and enhance the architectural style of any home. Moreover, a skilled installer can create a variety of laying patterns, further expanding the customization possibilities. • Pavers do not require time to cure. Unlike concrete, which can take 3 to 5 days before being ready for traffic, paver structures can be used immediately after installation. • The high number of joints in the surface facilitates the drainage of water. This enhances skid resistance and decreases nighttime glare. If deformation or sinking should occur due to shifting of the base, the structure can easily be repaired by removing individual pavers, re-leveling, and then reinstalling the same pavers. • Traditional concrete, asphalt, brick and gravel pavements clearly pale in comparison to the beauty, durability and easy maintenance of brick pavers. Oldcastle Coastal is your complete resource for Masonry and Hardscape products. With quality name brands such as Belgard, Anchor Wall Systems, Pine Hall Brick and Interstate Brick we take pride in manufacturing the best quality products and representing the premiere product lines in the market. We also offer a diverse range of Green building products for the environmentally conscious. For new projects or remodeling, nothing transforms an environment like the Tremron Group Hardscape Collection. Our hardscape products combine quality craftsmanship with exquisite design. Your commercial or residential project will emerge with beauty, durability and style. Our four Florida manufacturing plants offer the highest-quality pavers, wall systems, green products, natural stone, clay pavers, Centurion Stone® and care products in America. We back every product, for every job, with superior customer service, on-time delivery and unsurpassed ease in selection and ordering. Committed to Applying Quality In Everything We Do!